It’s my mummy’s birthday (happy birthday ma!) this week and we celebrated with a huuuuge seafood feast! 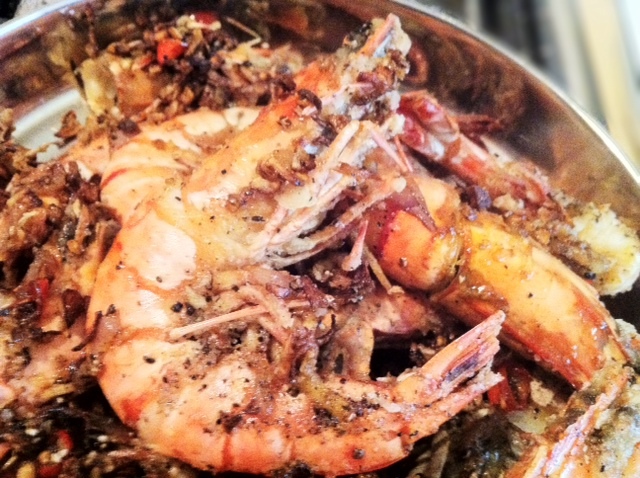 These prawns were superb and really quick and easy to prepare. You can even make it earlier in the day and just warm them up on a tray in the oven. They’re inspired by this recipe. My version below. In a dry pan, roast salt, black pepper and cinnamon until fragrant. Remove from heat, add sugar and stir well. Dust prawns in corn flour and deep fry until red and crisp. Set aside on paper towels to drain oil. In a pan, heat a little more oil with butter. Add shallots, garlic, ginger and red chillies, fry until fragrant. Add prawns and stir well. While stirring, sprinkle salt and pepper mix over prawns. Ensure the prawns are well coated. Add as much of the mix as you wish, most of the salt will fall off as the prawns will need to be peeled before eating. So don’t worry about over-salting them. These go really well with chilled beer. Enjoy!